This will not become a general discussion about the development of standards in the maritime industry. Even though it is not a discussion about technical aspects or the efficiency of sewage treatment plants in detail. It is also well known to us, that specific STP’s are just on board without any relevant usage over years. Nevertheless, from our point of view it is an absolute must to protect the (maritime) environment with appropriate measures. International standards have often been the smallest possible compromise for processes and procedures. However, in case of IMO with its MEPC standards for sewage treatment, we can look back on a long history and development, which leads us to the actual challenge to become as efficient and effective as land based plants. For one or the other, this is definitely overshoot the target. Nonetheless, what are international rules worth, when people ignore them or, even worse, try to manipulate authorities and their own customers to gain profit or to reduce own effort? This cannot be a win situation for anybody at the end. The point is, that nearly all people related to the maritime (sewage) industry are very confident with the actual certification requirements, but astonishingly only few people have the skills to recognize a valid certificate. As an example in the following you find two pictures demonstrating the typical dilemma. 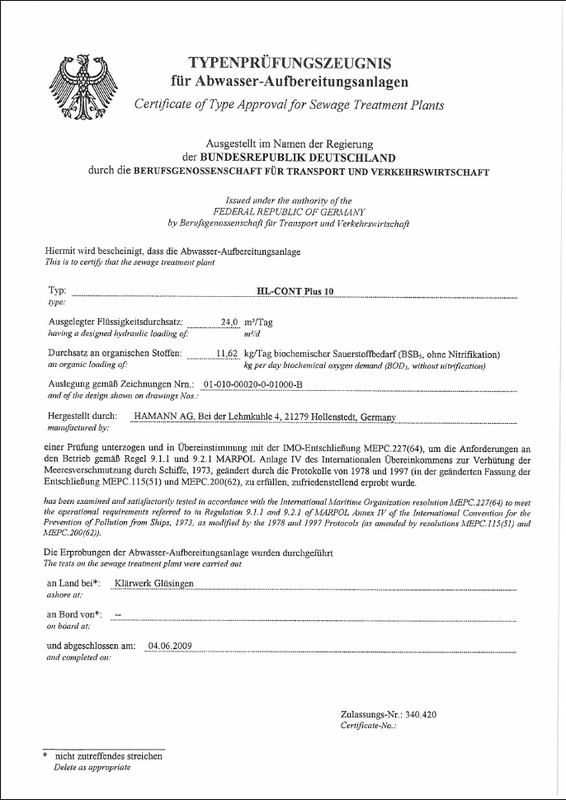 WHAT DOES AN IMO CERTIFICATE LOOK LIKE? 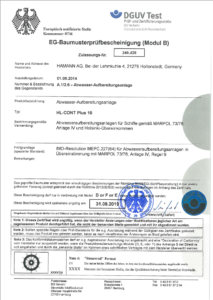 The first one shows an official IMO-certificate related to MEPC 227 (64) for our plant HL-Cont Plus 10. The second one is just a type approval which belongs to the same type of plant but is needed in a totally different context and proves totally different aspects of the plant. 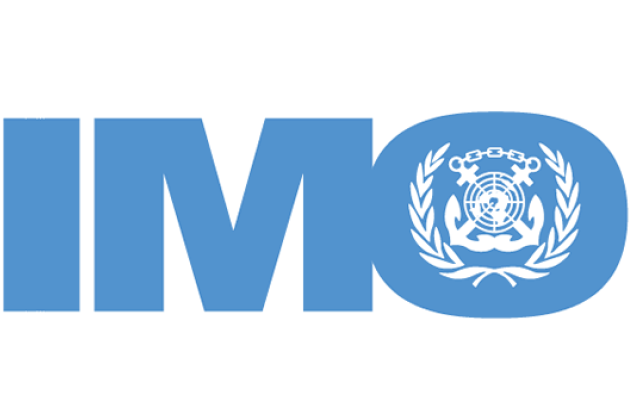 There are very much different kinds of official type approvals imaginable and none of them can replace an IMO-certificate. 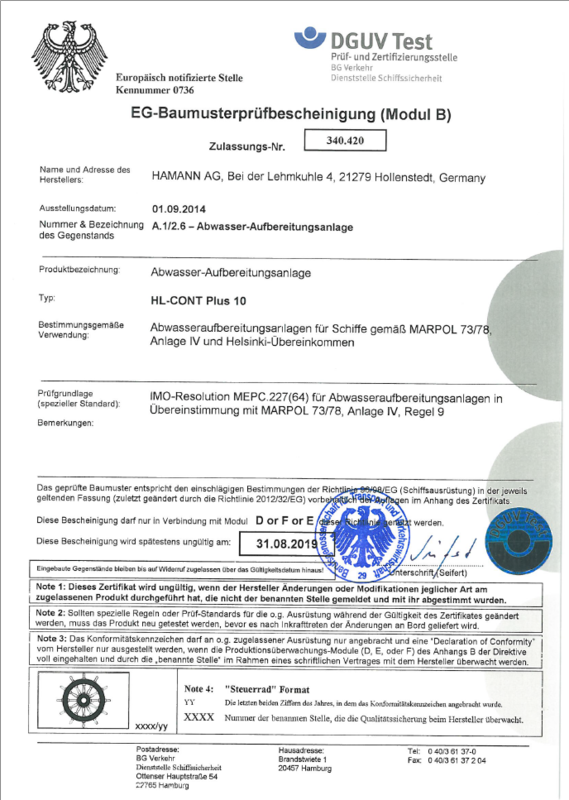 At first sight, many people would say, that the second picture shows a more official document and would automatically declare it as an IMO-certificate. In fact, there are vendors, pronouncing to be IMO-certificated, well knowing that they are only type-compliant. 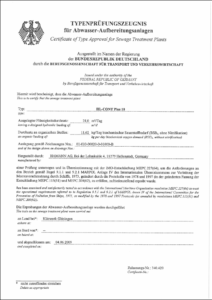 Within the official certificate, the vendor proves in- and outcome values of treated water and additionally shock- and climate-resistance. The typical type approval is based on vendor-own-documents and declares in summary that the vendor has the right rules in mind, but it does not declare that these rules have been applied. Too many owners, designers and authorities are not familiar with these differences. This results in believing to talk about IMO-compliant plants, but this is definitely a mistake. In general, it is quite easy to check, if a certain plant is IMO-certified. There is even no need to have a close look at the certificate itself. You simply have to check, if the vendor is listed with this particular plant according to a certain standard (MEPC.159(55), .227(64) or .227(64)-special area) in GISIS (Global Integrated Shipping Information System). Nearly all relevant vendors are listed, but many of them do not have the expected entry in this list. This means, some vendors are operating with (simple) type approvals instead of expected full compliant IMO-certificates. In general, many people and authorities are not aware of the above-described dilemma. Even worse, many players are aware of this and trying to gain benefit. What does it matter to use something different like an IMO-certificate? It saves much money and opens a market without proving standards. Moreover, consequences? Actually nearly none. Nevertheless, this will hopefully change soon. The remaining question is who will have to take the consequences? Of course the ship owners. They will have to pay penalties and will experience a lower resale revenue.